I can’t even begin to think where my life would be had it not been for the bus ministry! My name is Angel Medrano; I live in Oklahoma City, Oklahoma. My wife and I are current members of Southwest Baptist Church under the leadership of Bro. Jason Gaddis who became pastor when Bro. Sam Davison retired in 2010. I was first introduced to the bus ministry when I was four years old and newly arrived from Central America with my parents and my older brother. Some faithful bus workers knocked on our door and invited my brother and me to ride the bus the following day. Without knowing any English, my brother and I blindly agreed and got up in time the next day to ride a school bus to church. My parents wanted us to have a church influence in our lives but never bothered to attend themselves. For the next 20 years, I faithfully attended church while riding on a bus. It was because of some caring bus workers that I was provided the opportunity to attend our Christian school. The Lord blessed my faithfulness on the bus and allowed me to become a bus worker my senior year in high school. 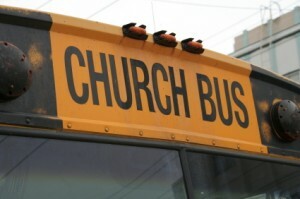 I got more involved in this same bus ministry once I started attending Bible college. To make a long story short, the Lord has allowed this snotty-nosed bus kid to now be a bus captain the same bus route that picked me up so many years ago. I still ride a bus on Sunday mornings, and I have the privilege of paying back a debt to my bus workers by giving my heart and love to my bus kids just like they did to me back when I was just a four-year-old boy from Central America. I write this testimony to simply say that God hasn’t forgotten about the bus kids and can use anyone who is willing to get involved in the bus ministry. One Response to "Angel Medrano"
Angel thank you so much for sharing your testimony. God has used and is still using you to be a great blessing in His service. I am so thankful for you.